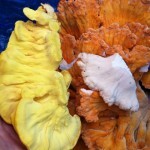 Chicken of the Woods is one of the most recognizable fungi of North America. It grows in bright white-yellow-orange brackets out the sides, or bases of trees and is generally found in large blooms. 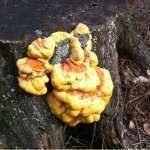 It grows in yellow-orange brackets. 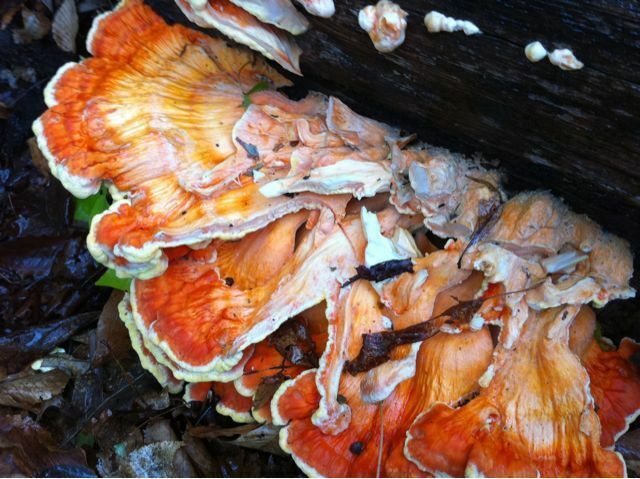 It has small pores on the underside of the brackets which are either yellow, or less commonly white. If there are gills or teeth, it isn’t a Chicken. When cut in half it has a texture similar to cooked, white meat chicken, especially half-way-to or near the base. If these above points aren’t met, you’re probably looking at something else. 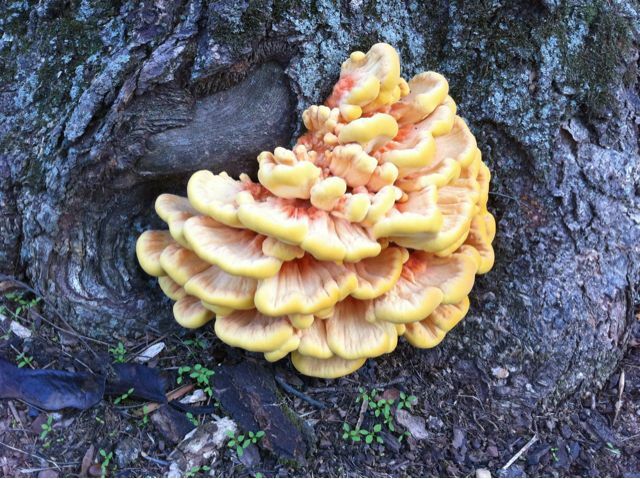 Identify which type of Chicken of the Woods it is. 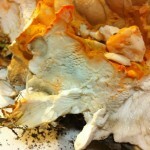 Pore Surface: L. sulphureus on left, L. cincinnatus on right. 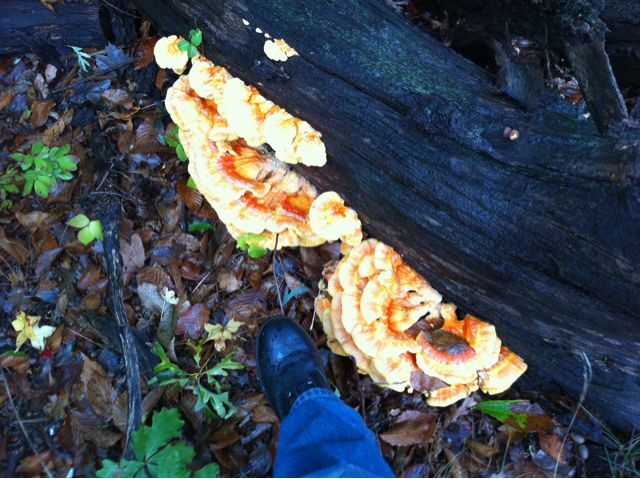 In New Jersey we have two: Laetiporus suphureus which has a yellow underside and grows from the trunk or base of trees, and Laetiporus cincinatus which has a white underside and grows up from underground roots of trees (or sometimes from the very very base of trees). Why is this important? Both are completely edible, but nearly every part of L. cincinatus can be eaten where only the outer, more tender parts of L. sulphureus are soft enough. The inner parts of L. sulphureus tend to get a bit corky or in some cases woody and require boiling in water or broth for an hour. Identify the tree it is growing on. This is important because if it is growing on cedar, pine or other conifers it may have absorbed some of their oils which are poisonous to humans (not poisonous-deadly, but poisonous-very-very-unpleasant). 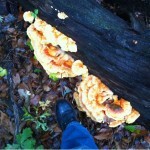 The best-tasting Chickens grow on oak in my experience. 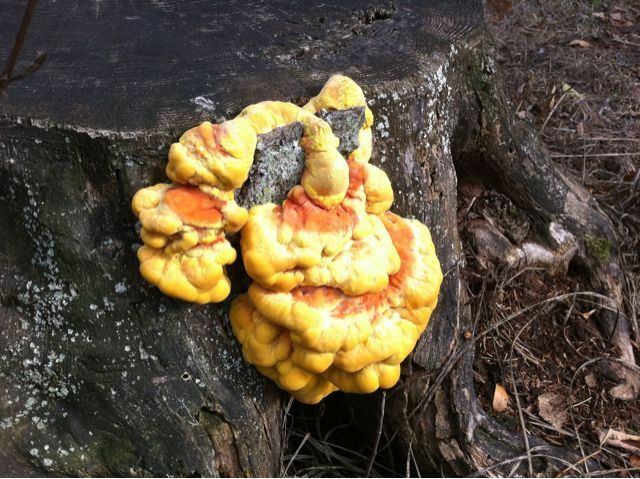 Undercooked Chicken of the Woods can upset your stomach. Proper cooking entails doing 2 things: Making sure that it’s cooked all the way through (which is easiest when you slice it thin) and watching the water content. 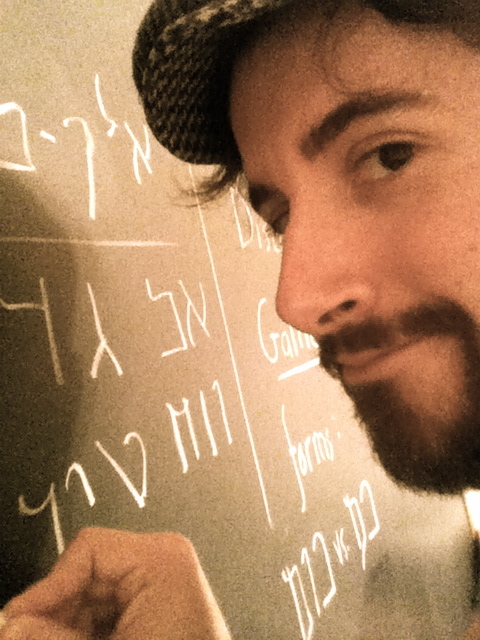 The less water the mushroom has in it, the firmer it will become. Like I mentioned above, if you’re cooking the inner-parts of L. sulphureus you’re going to want to use more water to get it soft. If you’re cooking the outer-brackets of a very young specimen, you might want to cook it a little longer to get some of the moisture out (otherwise it might be unpleasantly soft). Eat a little before you eat a lot. 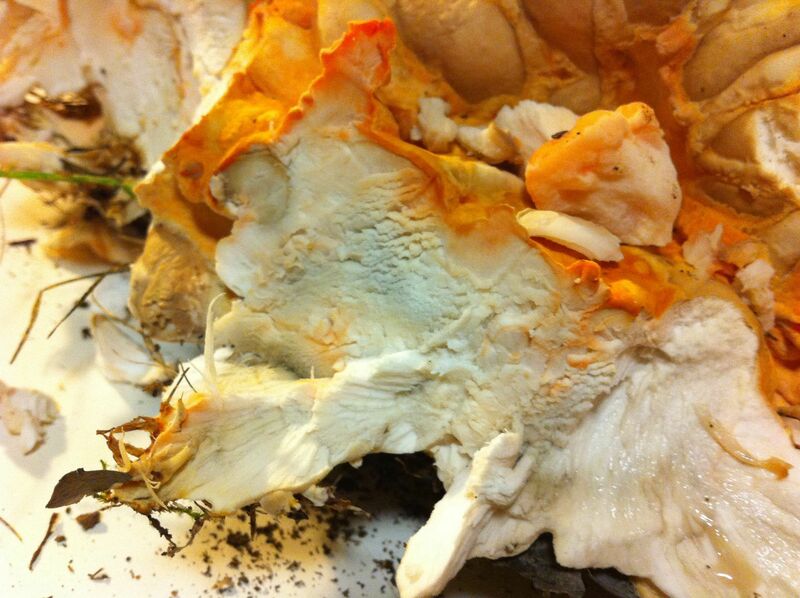 Allergic reactions to Chicken of the Woods even when thoroughly cooked are very very rare, but they happen. 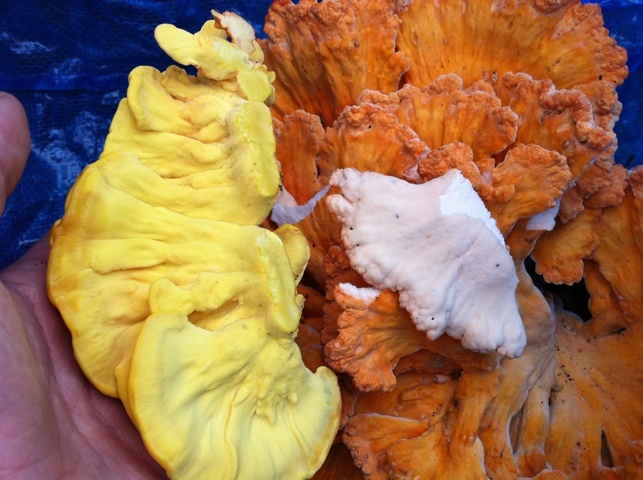 If it’s your first time having Chicken of the Woods, to make sure that you won’t have a stomach upset and that you’ve cooked things far enough, take a small nibble of a finished piece and wait for an hour or two before eating any more. If your stomach is fine and there’s no swelling anywhere, enjoy. 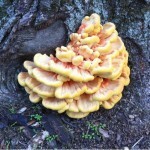 Click here to view entries for Laetiporus sulphureus in my mushroom journal. 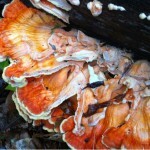 Click here to view entries for Laetiporus cincinatus in my mushroom journal.